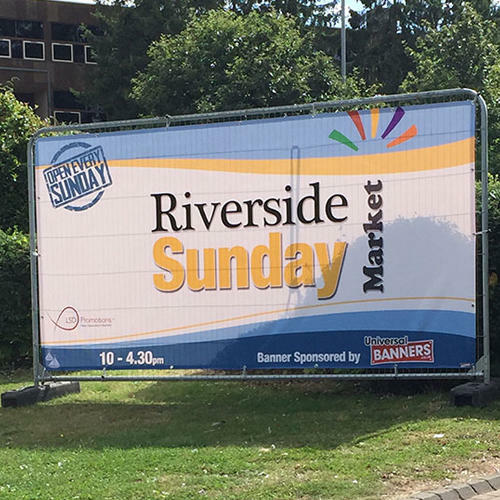 Universal Banners Heras (banner/scrim) are specifically designed to take advantage of the size and impact that Heras fence panels have, These can be used for purposes such as crowd control, construction sites, zoning off. Full colour digital print, with high strength heat welded hems and nickel eyelets printed and finished right here in the UK. Standard size for our Heras banner is 1.7mm x 3.3m. Other custom sizes are available if you only want to add a header or footer. Universal Mesh Banners provide a wind/air flow release of up to 40% ,reducing the load on structures and fittings. Waterproof banners are printed with fade proof eco-solvent inks. PVC banners are also available for low wind applications to use on your Heras fencing.